When I was an intrepid eighteen year old, I took off to Switzerland to work, first in an hotel and then as an au pair. I’d never been there before and I didn’t speak the language, but throwing myself into the thick of it was a very effective way to learn French. Of the many culinary experiences I had there, chocolate aside, Bircher muesli was my favourite. Bircher muesli, for those not in the know, is effectively what we are now terming overnight oats; it has a base of rolled oats soaked in water and lemon juice to which dried and fresh fruit is added. It was developed by Swiss physician and nutritionist Maximilian Bircher-Benner around 1900 after he came across oats soaked overnight on an Alpine walking holiday. He prescribed it to his patients to give them a raw energy boost. There are now numerous recipes and ways of making it. The Bircher muesli I ate in Switzerland was soaked along with grated apple, dried fruit and nuts. Fresh fruit, yoghurt and thick Swiss cream was then added to taste before eating – no wonder I was so enamoured. I’ve always loved a good breakfast and there is something a little luxurious about eating a bowl full of creamy goodness which has been prepared the night before. However, although a long soak is best practice, not all of us are that organised and actually thirty minutes soaking time still gives a deliciously creamy result. 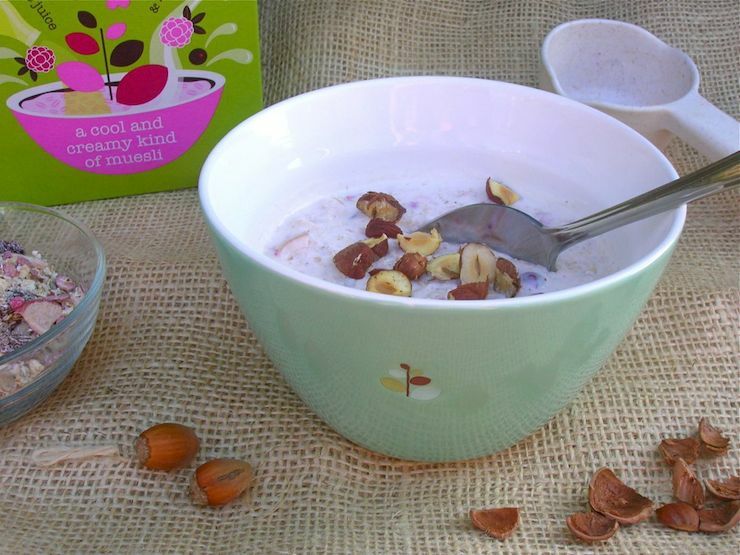 This is all that’s required with Dorset Cereals’ new Bircher muesli. I tried the raspberry and blackcurrant out the other day and really enjoyed it. Why, I wondered, do I not do this more often? With breakfasts usually being a very rushed affair, having to wait thirty minutes between preparation and eating can be a good thing. Thirty minutes to yourself to do something positive can relax and improve happiness, according to life coach Liz Wilde. Don’t despair, if you can only manage fifteen minutes “me” time, Darina Allen reckons that’s all you need in the way of soaking. My favourite thing to do of a morning is to go out for a brisk walk. I love the light of early mornings and as I work from home, mostly sitting at a desk, it both invigorates and relaxes as well as giving me time to think; I don’t do it nearly often enough, however. Thirty minutes is just the right time for a good stretch. And what bliss to come back to a bowl of comforting Bircher muesli just ready to eat. It’s been a while since I last reviewed Dorset Cereals, so I was happy to try out their new Bircher muesli mix made with fine-cut oats and barley. Now which of the two flavours to choose first? Almonds and Honey contains raisins, apple, almonds, roasted hazelnuts, sunflower seeds, coconut and honey whilst the Raspberry and Blackcurrant replaces the nuts and honey with freeze dried raspberries and blackcurrants. These make what is a fairly easy breakfast even faster to prepare. Simply add apple juice and yoghurt, stir and leave for thirty minutes. As usual, I went my own way and used kefir instead of the apple juice and yoghurt and added two scoops to one scoop of Bircher muesli, which I found to be just right. It tasted both creamy from the kefir soaked oats and tangy from the fruit. I then topped it with some foraged hazelnuts. Sorry squirrels, first come, first served. Dorset Cereals is kindly offering one Tin and Thyme reader five boxes of Dorset Cereals – two bircher muesli, one porridge, one muesli, one granola. To be in with a chance of winning, please fill in the Gleam widget below. You will need to leave a comment on this post, answering the question, which then gives you additional chances to enter if you so wish. Gleam will pick a winner at random from the entries received. If you are commenting anonymously, please give me some way of identifying you as I will be verifying the validity of entries. Any automated entries will be disqualified. This giveaway is only open to those with a UK postal address. Winners will need to respond within 7 days of being contacted. Failure to do this may result in another winner being picked. Prizes are offered and provided by Dorset Cereals and Tin and Thyme accepts no responsibility for the acts or defaults of said third party. Tin and Thyme reserves the right to cancel or amend the giveaway and these terms and conditions without notice. Do have a look at my giveaways page to see if there’s anything else you’d like to enter. Disclaimer: I received a soak-it-up breakfast kit from Dorset Cereals. I was not required to write a positive review and as always, all opinions are my own. I tidy the kitchen, do any washing up, go around the house and open all the blinds/curtains, write a list of jobs for the day, and my cereal is about ready! A little tidy of the kitchen from the night before and a quick read of the newspaper. a quick dust around the (black) TV stand, where does it all come from? Play same games with my kids! long soak for me in the bath! I’d grab a glass of wine and flick through a magazine! I’d put the washing machine on, have a quick tidy up downstairs, and then enjoy my breakfast knowing those jobs were already done. load washing machine and put on, unload dishwasher, reload dishwasher, fold laundry, have a quick ‘pick-up’, make myself a coffee. I’d have a soak myself! Love nothing more than relaxing in the bath tub! I think I’d spend the time fretting about whether I’d manage to eat my breakfast in time before I had to dash out of the house. Hehe. Sorry, even being forced to relax for 30 mins won’t actually make me relax properly. What a wonderful adventure your life has been! Haha Liz, parts of my life have been very adventurous and many parts not so. CT and I hitched and wwoofed our way around Australia and New Zealand for a year once – plenty of adventures then. Read whichever book I’m reading at the time. I would sit down with tea and biscuits and watch a bit of TV in peace. Get showered and ready to face the day. Or as ready as I can get, which isn’t very. A hot bath in peace, on my ow sounds lush! curl up with a book, a cat and a cup of tea. Bliss! Feed the Baset Hounds be for i eat and shower. Catch up with my favourite TLC reality shows! I’d probably get cracking with my house cleaning, it’s nearly Christmas! Go out for a run or probably just spend more time in the shower and getting dressed. I’d completely relax my body, the smell of scented candles and some calming music! Hot Shower, Close Shave and Shampoo. I’d like to say comb my hair, but there’s not enough left! I’d be on my computer comping! As you say, a lovely brisk walk first thing in the morning is a great way to start the day, followed by Bircher Museli, what could be better? I would go for a run and spend the whole time looking forward to my treat for when I get home! I would read a magazine and listen to some music. I’d have a nice cuppa and flick through a magazine. Probably quite boring but I would get as much housework done so I could then sit, relax and enjoy. I like to peg out the washing, make a brew, and catch up with my emails before breakfast. Read a few chapters of a book and put my feet up! Soak the mix in apple juice overnight in the fridge and, if it’s a weekend and I have any left, add a bit of port or better still brandy as well. I would have a soak in a bubbly bath and finish my book. Probably tackle the ironing pile! I would read a magazine with a hot chocolate complete with marshmallows and chocolate sprinkles. catch up on the housework, well a quick dust! Sit down and relax and drink a glass of fruit juice before my cereal is ready. I’d tick a couple of things off my to-do list. Being organised always make me feel relaxed. I would settle in with a good book, a mug of hot chocolate and snuggle up with hubby and our pooch. I find having the TV on is a major time sucker so anything that involves switching it off and spending a bit of time with the family while appreciating the little things is a good thing. For me it would be a good book and a nice cold drink to enjoy it with! i would pop open the sparkling stuff! I would have a bath and get dressed. I would take the dog out for a walk. I would sneak onto my laptop and read a few blogs and enter a few competitions. Have a quick tidy up and get clothes ready for the next day at school. I’d do a bit of dancing in 30 minutes. I don’t always have the full time but I like to do it in the morning as it wakes me up, and also, I’m losing weight and this helps! Hi – I’d love to say I’d do yoga, or housework or special me time – in those precious 30 minutes of soak-time. And maybe I would once or twice. But in reality I’d probably have an extra 30 mins in bed or watch TV. Well…lots of things but thirty minutes is just enough time for my four year old to thrash me at football…again! Then a healthy breakfast to up my stamina! I’d probably read – I love a good book and reading relaxes me! some wine and finish my book i feel like ive been finishing it for ages! Clean the kitchen and load the dishwasher. In reality I would put on a wash, have a shower and tidy the whole of the downstairs. However I would love to have a long luxurious soak in the bath with no children. Get on the exercise bike and work off some of the calories before I eat them! I would lie in the bath doing absolutely nothing! a very rare treat with 3 children!! I go and grab one of the cats lay cosy in bed with a hot water bottle and a shared blanket my other half joins for a little chat and the cat sleeps. I’d practice my ukulele playing….it needs all the help it can get! Haha Pam, so does mine. I don’t think I’ve picked it up in about 5 years! Definitely read a few chapters of my book, I never seem to find the time! Have a lovely big cup of tea and play with my granddaughter. Would most likely eat this at work so would be dealing with all the usual nonsense there…..
Cup of tea, some trash tv and 2 or 3 or 4 biscuits! I’d fit in a 30 minute exercise burst as I’m finding it hard to fit in with everyday bust life! I’d use the extra 30 minutes to prepare my lunch and snacks for the day/week ahead. I’m trying a healthy eating plan and need to learn to start doing more planning and preparing, but never have the time! Tackle a job on my list that never gets done – just think how much I could achieve over the course of a month – I can but dream! I’d listen to music, the Beautiful South are my favourites. An extra half an hour in bed! I would take the dog for a longer walk. have a long hot soaky bath and sing rather loudly and rather badly! I’d stick the washer, dish washer and dryer on, hoover then brew up ready to eat my breakfast – busy mum of 3 needs to utilise every minute! i would soak in a long hot bath scoffing chocolates and drinking wine! I would use it as exercise time! Winter does me no favours haha! I’d like to say something exciting, but probably clean the kitchen and the rest of the house as quick as I can! I get very industrious when I’m baking. I would use the time to catch up on reading in total peace and quiet, lovely. I’d probably spend 30 minutes deciding what to do with my rare 30 magical me-time minutes, before realising time was up! Fire up YouTube, I am addicted to those top 5, 10, 15, 25 videos might get through at least 2 in the 30 minutes. Get the muesli soaking first while I get myself ready – washed, dressed and get stuff I need for the day ready. Then my muesli is ready to be enjoyed and I am ready to face the day! After I had loaded the washing machine and put away the dishes left to drain overnight I would indulge in some quiet reading knowing everything was under control. Lie in a lovely bubble bath for 30 minutes and put a refreshing face mask on. Make a cuppa and write some Christmas cards, which I hate doing with a passion and really should stop. I’d go downstairs and do a little bit of meditation. I’d use it to clean – challenging myself to get the house/chores done within the 30 minute time limit! Get my blood pressure and heart rate down by just chilling. I’d have a lovely hot shower and wash my hair. I would make a cup of tea and relax in bed for a little longer! Sort out my boxes of photographs. I would walk the dog and enjoy the fresh air. Do some ironing…. but not too much as I can’t actually fit everything in the cupboards at once! Ha. Go and have a knees up with the next door neighbour to celebrate my extra 30 minutes. Now that is a lovely idea Anna. Reading with my mother as a child is a very positive memory for me. I would do 30 minutes of yoga or Pilates in my living room. I’d put my feet up and get some well deserved relaxing done! I’d leave them to soak whilst I make the kids packed lunches and iron their school uniforms. I would definitely do some online shopping. I’d like to think I’d have a bubble bath and a bit of a relax. But in all honesty I would probably just sit on my bed and lay down!! I think a bath is perfect wind down time and I’d put lots of bubbles in there, grab a book and listen to music. Watch Masterchef Australia – I’m obsessed! Read a book – bliss! Feed my 3 cats, empty the dishwasher, make freshly squeezed orange juice and make coffee for my hubby and fruit tea for myself. A nice wee soak in the bath&read of a good book. I’d probably go and have my shower, then get the kids up! Read a book on my kindle while in a hit bath! My fav place to read! I’d put a CD on and dance round the kitchen. Tidy up the kitchen & have a nice shower to wake me up! I will read my daily light book and pray.